I was out on a walk today and saw some really neat critters. Well, they wouldn't be neat to everyone... just a weirdo like me, because these critters included a praying mantis, a tree frog, and a snake. Yes, I know I have issues. However, I was really excited about all the neat critters I met today. "Yep, this will do just fine for Today's Flowers." I thought. great photo's, I did butterfly ones last week, they are always a joy to photograph. Great shots. Very nice blurred backgrounds. Definitely a lovely find and with a Wonderer Buttelfly to boot. It just goes to show, walking is good tor you! Perfect shots and so pretty! 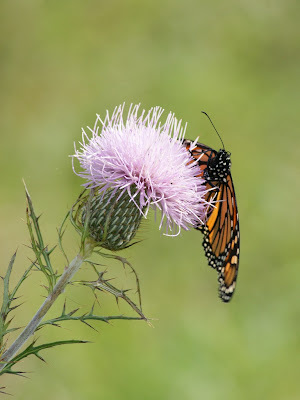 Misty: What a neat shot of the thistle along with the Monarch. You did well. How clear and sharp is that shot?! Wow Wow Wow!!! Excellent capture. Perfection indeed! 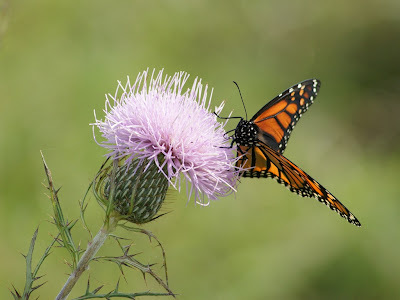 And you're right, the thistle and butterflies will soon be a sweet memory. Thanks for sharing--even the snake, et al. Nice post! These shots are so clear and crisp. Great capture! Great shots, thanks so much for sharing. What a beautiful monarch! I love these shots!